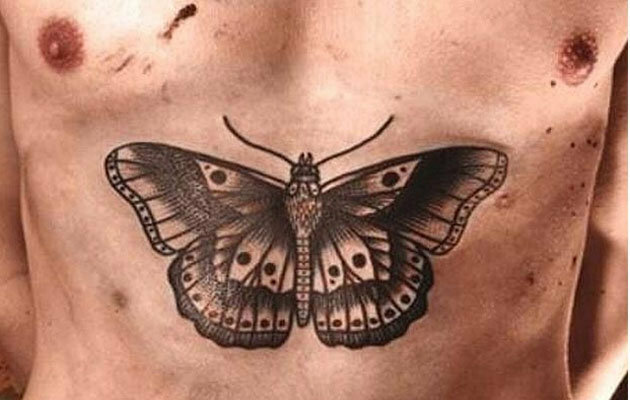 The One Direction star - who is believed to have more than 30 inkings on his body - got large image of a black butterfly on his torso, which was revealed by his tattoo artist Liam Sparkes via his Flickr page just a few days before his birthday on February 1. While Harry's face cannot be seen in the picture, the other tattoos on his body made it easy for fans to identify him and according to the MailOnline.com the 'Kiss You' singer showed off a glimmer of the artistic marking through a gap in his shirt at his birthday bash in London. The British heartthrob has yet to comment on his tattoo but his mother Anne Cox was previously said to be worried that his obsession with them has gotten "out of hand". A source said: "Harry's mum is worried his tattoo collection is getting out of hand. "She thinks he's getting addicted to sitting in the artist's chair. "She's concerned about the lasting effects of the scribbles all over his body and thinks he could live to regret some of them. "Harry loves the Japanese symbols. He's determined to have Japanese calligraphy on him. "It wouldn't surprise me if he gets it done sneakily." The group's mentor Simon Cowell has also urged the pop star to give his tattoo habit a rest after he got inked more than 30 times in the last 12 months. Harry's other tattoos include a ship, a shamrock, place names, his sister Gemma's name in Hebrew, a heart and a pair of birds on his upper chest.